This summer we are getting hit by a ton of what looks like - at least from the previews so far - great flicks. The season starts early this year with the March release of Oz The Great and Powerful and Jack the Giant Slayer, but I suspect most folks won't think it's started for real til Iron Man 3 hits screens in May. The toys are already out at most mass market retailers, and I haven't seen anything ground breaking or unique as of yet. But it appears that Hasbro has picked up a bad habit from Mattel - creating 4" scale figures with crappy articulation. 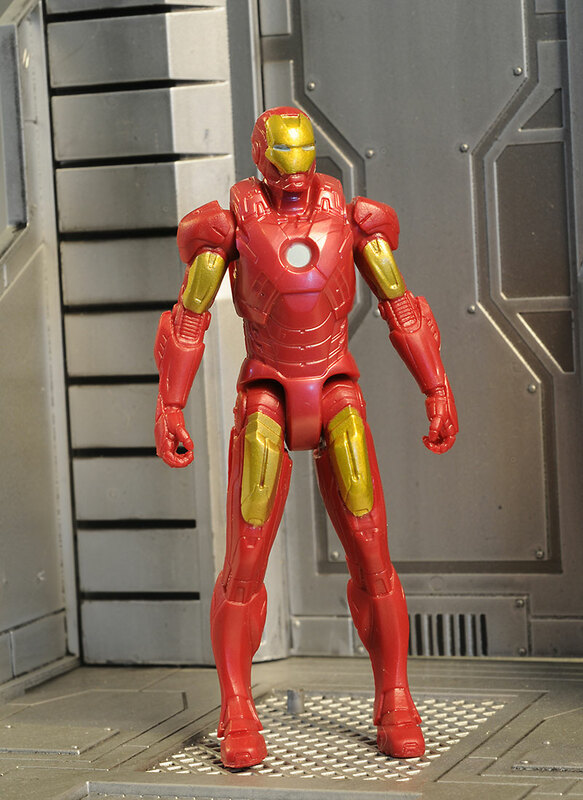 We've seen Mattel do it with the Dark Knight Rises line, and now Hasbro has a similar series out for the new Iron Man film. 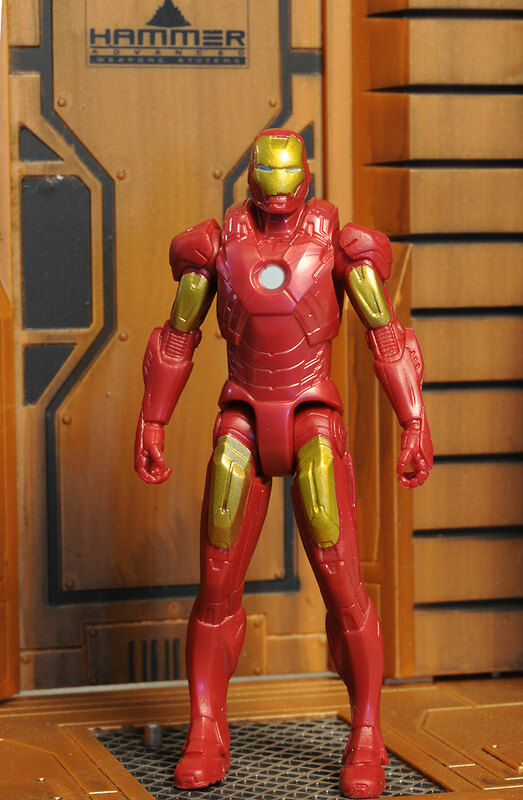 The series seems to consist of nothing but Iron Man variants so far, again, much too similar to the awful DKR line. We ended up with a Bane and a Catwoman in that series, but they were totally overshadowed by the billion Batmen variants. Time will tell if we get anyone else in this scale with Iron Man. Clearly, the upside here is low cost. These figures run around $6 at most major retailers. The packaging is pretty basic, but at least there's no twisty ties or rubber bands. It's not collector friendly, but I didn't really expect it to be. I do like the color combination though, and they stand out pretty well on the peg. These figures are in Hasbro's usual 4" scale. 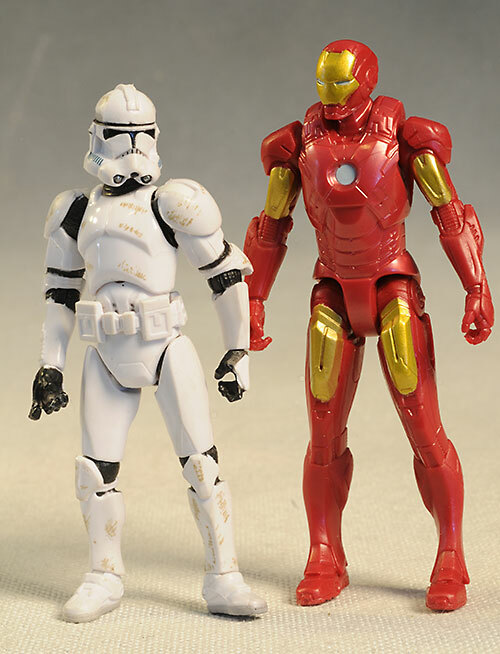 Iron man comes in just a smidge taller than that, making him fit in pretty well with other lines in this scale, including Star Wars. 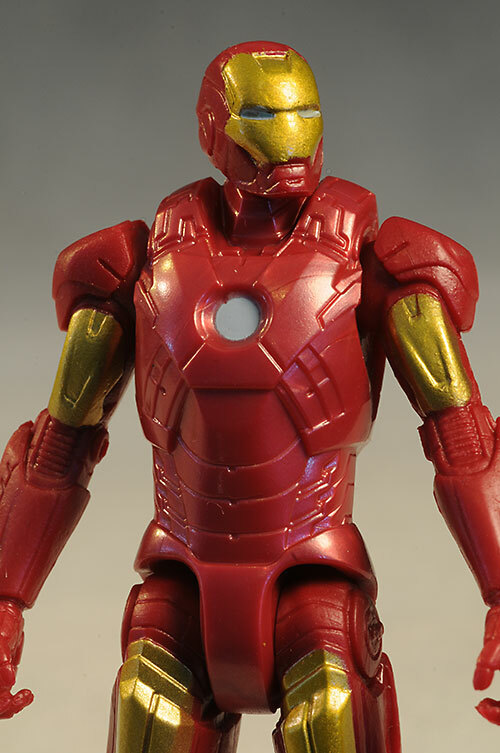 The sculpt isn't bad - the suit looks good, and there's a nice, sharp definition to the edges. Mine came with warped ankles out of the package, and they are bad enough that I'll have to use a hot water/cold water bath to straighten them. While this is a small figure, the paint issues are bad enough to still make a difference. There's not a ton of ops here either, another negative. There's a little gold on the front, but none on the back. In fact, there's no paint ops on the back at all. The gold isn't great either - the edges on the mask are poor. The torso has a pearlescent appearance that's nice, but it isn't matched on the arms and legs. 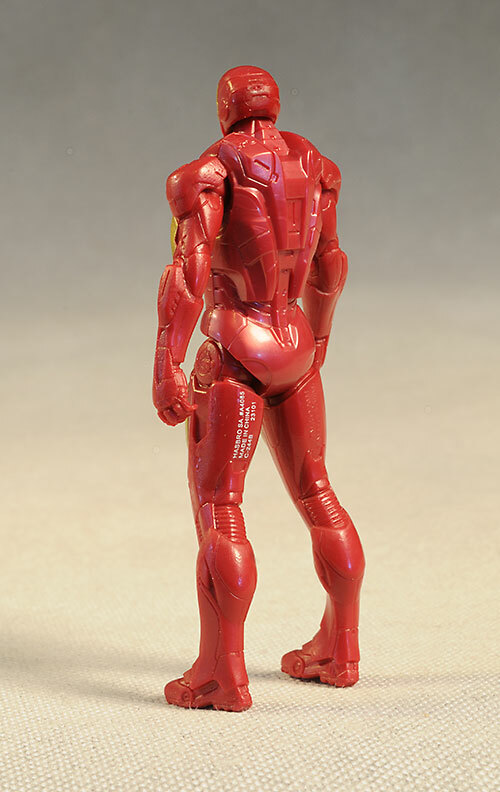 It's the 80's again, and action figure articulation is 5 point - cut neck, cut shoulders, and cut hips. That means he can stand up straight, he can hold his arms up like he's flying, and he can sit down. That's it, and that's lame. We know how good Hasbro can do articulation in this scale. Even when they aren't trying, they do it better than this. It's a mistake to take a page from Mattel's book in this scale and go with this weak design. 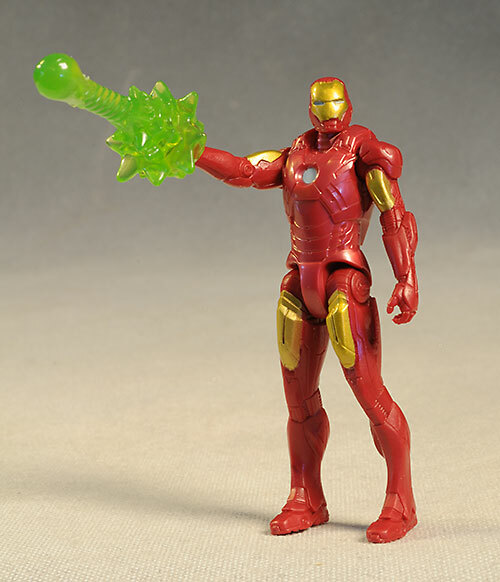 There's one accessory - a rubbery repulsor blast that fits over either hand. It's a minor detail that the blast shouldn't cover his hand (since it comes from his palm - this isn't Johnny Storm after all), but I'll let it slide. While I hate the articulation and retro-level quality, I have to admit that kids could enjoy playing with these...except for one big issue. Who is this Iron Man supposed to fight? It's the same issue the DKR line had with just Bane in the regular series - there's just too many of the main character, and not enough diversity to allow for a kid to have any fun. And here's the reason for the weak articulation - price. With other 4" scale figures running $8 - $10 (depending on the retailer), it's tough to produce a ton of figures in a series and get them to sell. Hasbro's answer seems to be to try to go cheap on the quality of the figure, drop the price, and hopefully sell more. 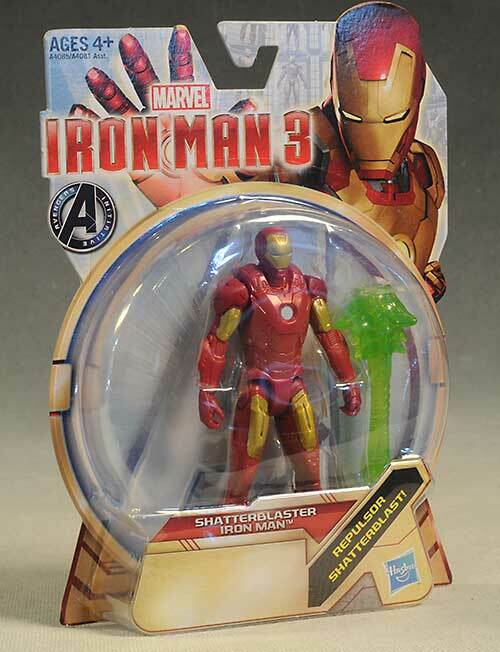 Sadly, this figure isn't much better than a Happy Meal toy, and the three or four bucks you'll save are not going to induce you to buy more, especially when they're ALL Iron Men. Not every action figure is over ten bucks these days - TMNT sell for $8 - $9 each, and have great articulation, great accessories, and a bigger scale. Comparing one of those to one of these? No comparison. I'm very disappointed to see Hasbro go with this cheaply designed style, since they are the masters of this scale. They've done wonders with Marvel Universe, and of course Star Wars, so there's no excuse - other than price - to go with this design. I suspect that it's not going to result in big sales, either. 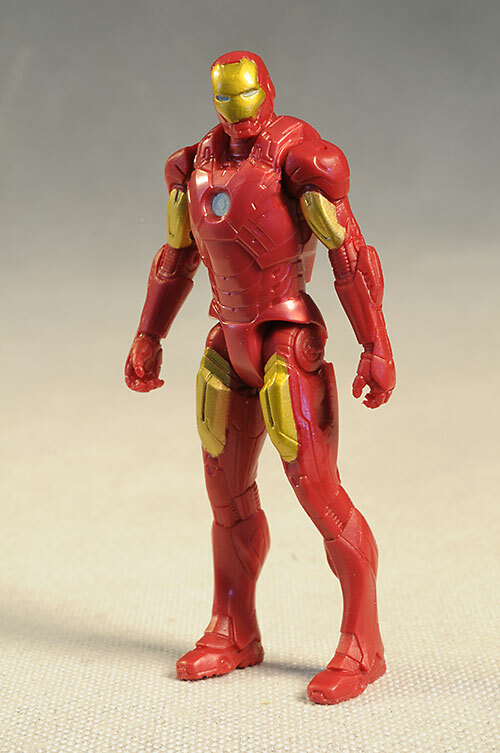 Without a lot of enemies or extras, kids won't be looking to buy 6 different versions of Tony. I picked this guy up at Meijer - you can find them at just about every mass market retailer for around six bucks. 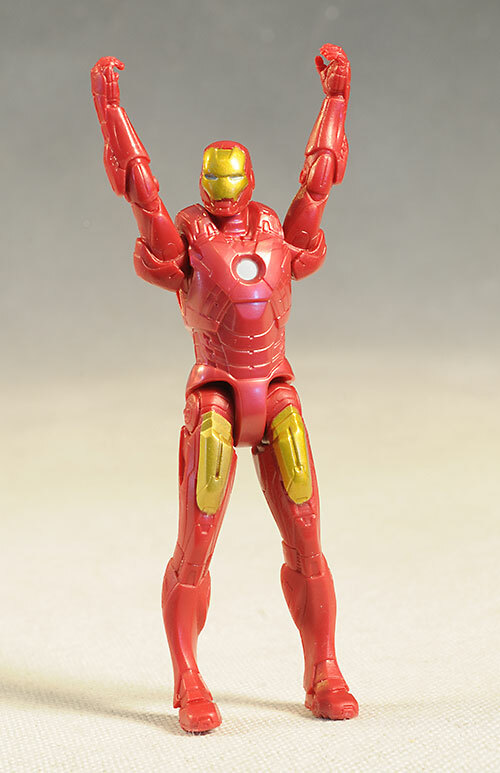 I've covered a ton of Iron Man figures over the years, and you can use the Search Page to find them. But the most recent was the first half of the latest Marvel Legends figures, and all three were far more articulated than this guy.